Jürgen Klopp wants Liverpool to learn from the way they suffered a 3-1 defeat against Borussia Dortmund in Charlotte after a second-half comeback. Virgil van Dijk headed the Reds in front at the Bank of America Stadium before the break and they had the better of the early exchanges when the action continued. But as tiredness set in, the Bundesliga side levelled through a Christian Pulisic penalty midway through the second period. The USA forward then put his team ahead one minute from time with a low finish and it was his strike that was parried into the path of Jacob Bruun Larsen for BVB’s third. 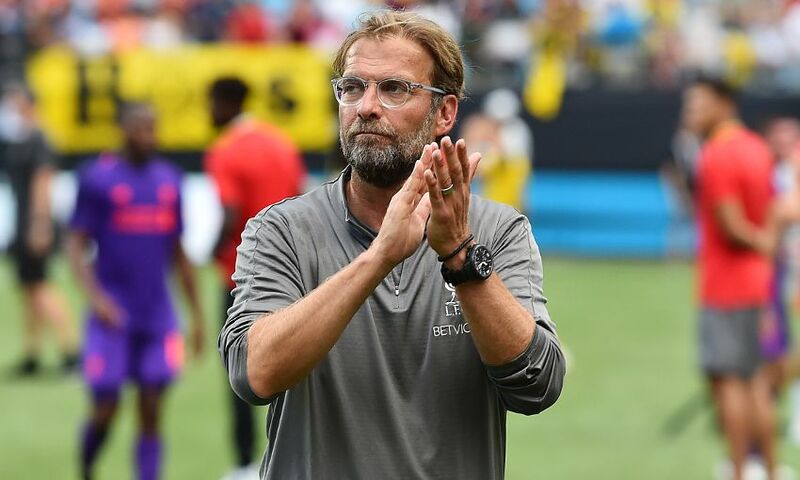 After the conclusion of the International Champions Cup clash, Klopp reflected on the performance and result, as well as the individual displays of Naby Keita and Daniel Sturridge. We’ve said it a few times, football is a results game. We lost, Dortmund scored three and we scored one so that’s then a fair result. For both teams it was obviously very difficult circumstances, the humidity and all that stuff. I think a few players thought after five minutes: ‘Wow, where are we here?’ So that was the football we played in the first half. It’s quite difficult in the moment – Dortmund have exactly the same problems – with these mixed line-ups to get kind of an organisation. We saw this in the first half. Fabinho position-wise should be the guy who organises but with Adam Lallana around him, Curtis Jones and the two wingers it was not easy. The beginning of Dortmund was good, then we controlled the game kind of but we didn’t create chances. But we scored the goal after a nice set-piece. Set-pieces were probably the most positive thing today. In the second half we played much better against a completely different Dortmund side. Our pressing was much better. Dortmund tried to play football and played our cards, if you want, which helps us a little bit to do this. We won the balls but we didn’t do very good things with the balls we won. The surprise is that we scored the goal in the first half and not in the second half. We had two big chances after set-pieces again with Dom Solanke and Joe Gomez. We had a big, big chance with Ojo. Daniel was in a few good moments. We had these moments and I liked the football we played there. We had two drinks breaks that were not drinks breaks deep in our own half, around our box. We lost the ball again, had it back and lost it again; Pulisic can go in the box and it’s a penalty. Dortmund scored a similar goal against City. That can happen, I don’t like it but it can happen and it’s easy to explain. On a day like this, you have to stay strong and show desire still or kind of greed that you at least want to keep the result at 1-1. At one moment we could have scored again and had this very tight offside situation. I watched it back and they were both onside but we cannot change that anymore. It felt like that in the game. It would have been two big chances, James Milner alone in front of the goal. It doesn’t help really and I don’t want to excuse the result but we had these situations and didn’t, or couldn’t, use them. Then Dortmund scored a second and the third was really too much. The fourth would have been possible after we lost the ball again, you could see morale was really down. We have to learn from it, that’s how it is, and then we have to go again. He can do much better, that’s clear. He was exhausted, he was really done in the last few minutes when they scored on the counter-attack. Usually Naby is fit and around the situation. I think it was the third goal, he couldn’t do it anymore. But, football-wise, he is in a very good way because he’s a naturally skilled player. In small spaces his first few yards are outstandingly quick, so that changed the situation a lot. He was good in the game and then the last game, maybe the half-time was 10 minutes too long for him. Today it was very intense for both teams; we trained this morning harder than we usually would do on a matchday but that’s how pre-season is. We still could have won the game but we didn’t. We have to talk about it because you ask questions but we don’t have to think too long about it. He is a creative midfield player with discipline; tactical discipline is a big strength of his usually. He’s doing the right things in the right moment, that’s how good players are. I don’t want to give him 500,000 [pieces of] information. We got him because he is the player he is and now we want to work with that. That means first of all we let him go and adapt to our system. I see him as an ‘8’, he can play ’10’ as well, maybe in the future he can play ‘6’ as well. At Leipzig, he played as a winger, that’s for sure not his best position but he can play it because he has the speed for it, he has the football intelligence for it. We see him as a creative No.8 playing the passes and making the runs with the ball. With the ball he has the same speed as without, you don’t have a lot of players with this quality. We know what he’s good in and we try to fit it into our game, but that should not be a big problem. He is in very good shape, that’s true. It was a very intense pre-season so far and he was part of pretty much all the sessions. He looks really good. Who doubts Daniel Sturridge when he is fit? I don’t. He is an outstanding player, hopefully he can stay fit and then the future is bright. He is still young enough, it’s not that he is 30-something. He is experienced as well and has this kind of natural arrogance that you need on the pitch, so you don’t always start anew if something doesn’t work, that you are out of the game for 10 minutes or, even worse, not involved for the full game. He stays in the game and it’s good for us to have him around. You saw it today. The second half without Daniel would have looked completely different. It was that good because we had Daniel in the right spaces and he could lead the group with the ball, if you want. That was really good. I’m fine with him, 100 per cent.